0 Comments Published by Jane on Sunday, July 06, 2008 at 7:00 PM. While Catherine is employed as a teacher, the rest of the eldest McDonough children seem to be employed at the L.W. Pond company. Thomas McDonough does not list his employer, but it is possible he is also working at his son-in-law's company. 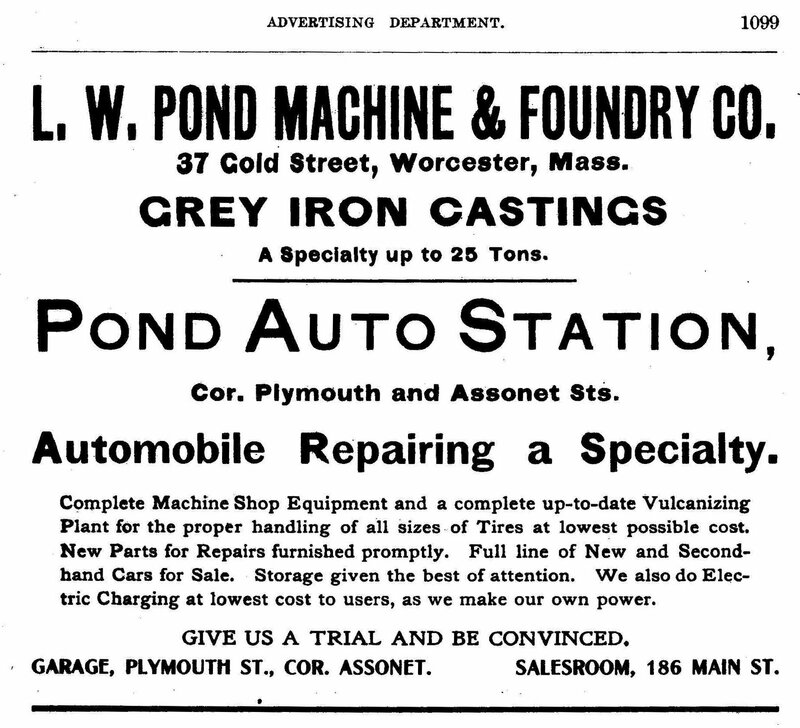 Another interesting tidbit - it appears, after reading the ad pictured above (click on image to see larger), that at least some of the cars sold at L.W. 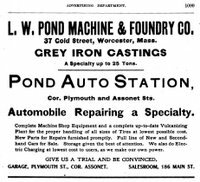 Pond are electric (when automobiles first appeared on the market they were not all of the gasoline powered variety). After re-reading the crazy car post, I believe that vehicle was also an electric car. 0 Comments Published by Jane on Wednesday, June 18, 2008 at 5:28 PM. 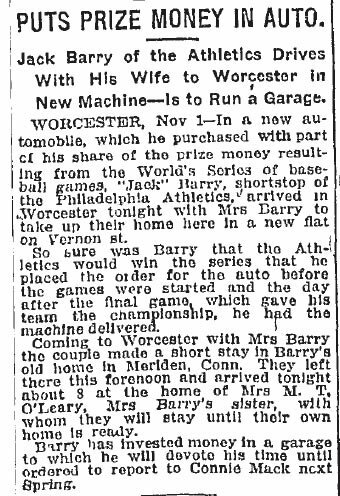 Some more searching in newspaper archives revealed this interesting article about Mary O'Leary (eldest daughter of Thomas and Mary McDonough). The car pictured below is what I guess the coupe mentioned in the article may have looked like - it is a 1907 Cadillac 10-Horse Power Coupe - however, I can't confirm this is the automobile. Mrs M. Thomas O'Leary of Worcester and Her Baby Rescued After a Most Exciting Ride. 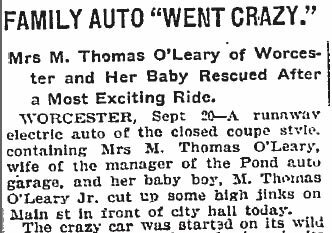 WORCESTER, Sept 20 - A runaway electric auto of the closed coupe style containing Mrs M. Thomas O'Leary, wife of the manager of the Pond auto garage, and her baby boy, M. Thomas O'Leary Jr. cut up some high jinks on Main st in front of city hall today. The crazy car was started on its wild career by the crossing of wires in its internal mechanism when the chauffeur threw over the lever to leave the city hall branch of the Worcester Trust company. The machine began operations by bucking into a horse attached to a carriage and the horse started on the run. The wheels of his carriage became locked with those of a wagon and the whole outfit was pushed across Main st to the city hall plaza, where the horses freed themselves and started on a run down Main st. 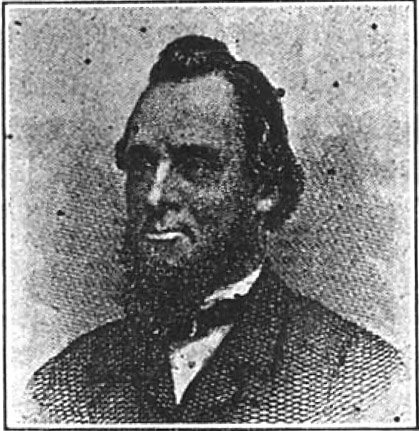 They were caught near the corner of Main and Park sts, one by John S. Holt and the other by S. I. Howard, the contractor who jumped from his own wagon to grab the bridle of one of the runaways. Left without a guardian, Mr. Howard's horse cut loose and added to the excitement for a few minutes until he was captured. In the meantime, the electric coupe was darting in and out among the other vehicles on Main st, beyond all control of the chauffeur, and only quick work on the part of the drivers of horses prevented further runaways and collisions. The police officers on duty at Harrington corner and at the corner of Main and Park sts joined in a chase of the auto, but there was nothing they could hold onto, and it slid away from them every time they grabbed it. Mrs. O'Leary and her baby boy were prisoners, as she could not open the door, and her shreiks of fear attracted crowds from blocks around. In one of the crazy gyrations of the machine it ran close to the curb of the city hall plaza and Mrs O'Leary saw on the sidewalk a man holding out his hands. As the machine bucked back from the curb, she tossed the baby from the window and the man caught the child. Back again across Main st the auto flew, and on the return trip it ran into the curb, where the wheels whizzed around in an effort to climb up onto the sidewalk. During the brief interval that the coupe was standing still, men in the street rushed to the door of the coupe and opened it and dragged Mrs O'Leary to safety. She had scarcely been removed from the auto than it gathered headway and started down Main st, turning into Allen ct, where it banged up against the curbstone and went out of business, as something weakened and a wire snapped. 0 Comments Published by Jane on Thursday, May 08, 2008 at 8:02 PM. 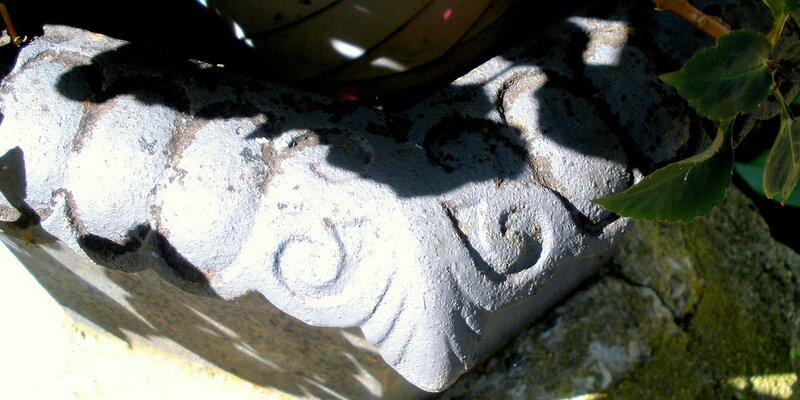 Address: 3 Germaine Street, Worcester, Mass. 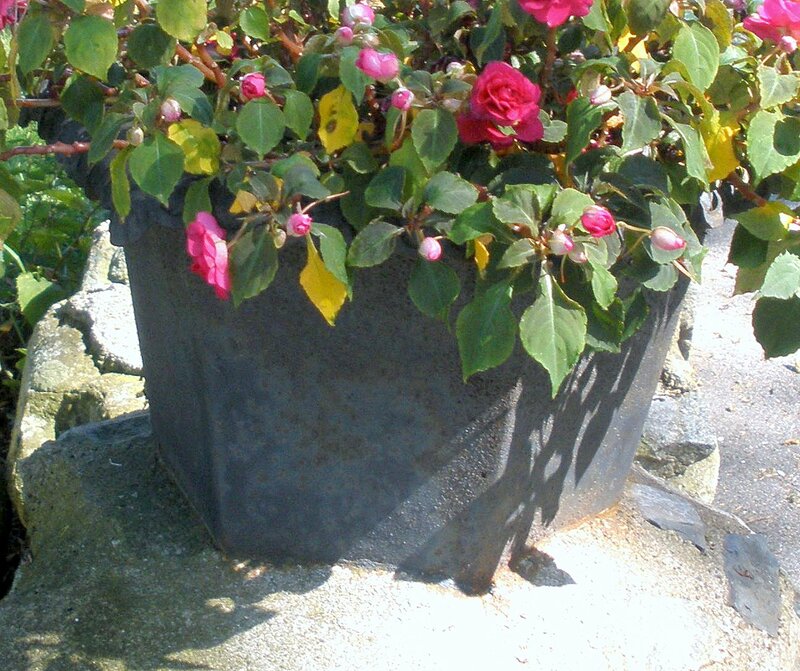 Employer's Name: L.W. Pond Mach. & Fdry. Co.
Has person lost arm, leg, hand, eye, or is he obviously physically disqualified? 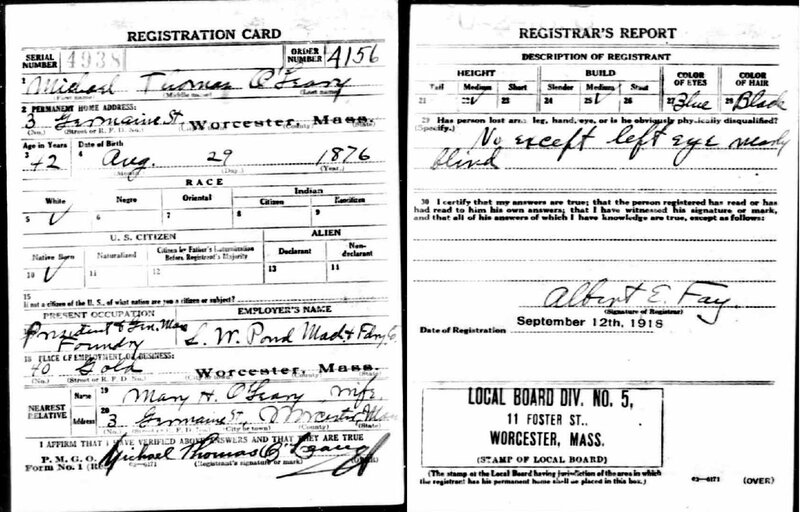 Some things to note from the information above - M. Thomas O'Leary died in February 1919, about five months after signing this draft card. He and Mary have moved from 1 View Street (where they lived for the 1910 census) to 3 Germaine St, which appears to be a single family home. The mention of his eye problem could explain why we see M. Thomas in glasses in this photo. Lastly, the registrar has the last name Fay - could he be any relation to Mary's sister's husband - James Fay? 0 Comments Published by Jane on Sunday, April 06, 2008 at 10:01 PM. Michael T. O'Leary lists his occupation as "Manager" of "Iron Foundry"
Steena Rhinehold gives her relationship to head of house as "Servant"
Steena Rhinehold lists her occupation as "Servant" of "Private Family"
What a difference 30 years can make. 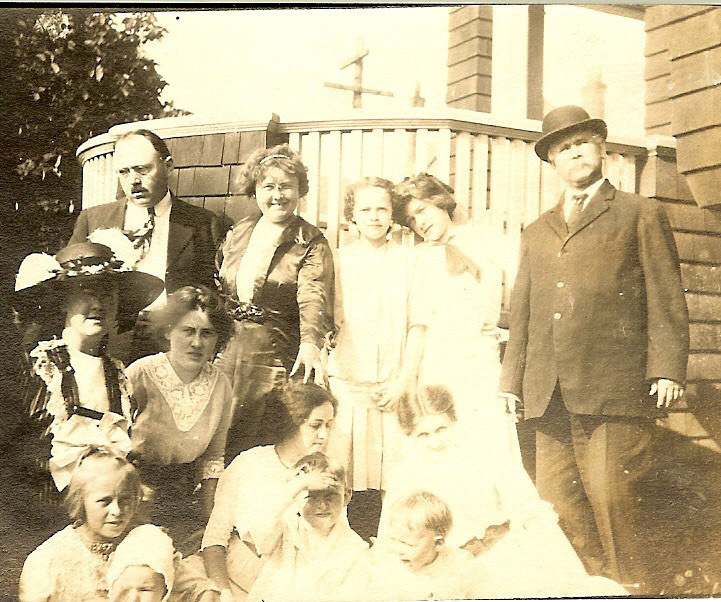 As a young mother Mary O'Leary had a live-in servant - a luxury her mother likely never dreamed of having when she was living in "corporate houses" and raising her young daughter along with boarders.